Collins was a very popular painter of his time. He was a landscape and genre painter from London. After his death, his paintings depicting poor enjoying nature became famous in the 1870s. He had about 200 major paintings done and 100 minor paintings. He was famous during his time as compared to his friend and rival John Constable, who is better remembered now. Much information about Collins life is known through his son Wilkie Collins two volumes Memoirs of the Life of William Collins. Wilkie was a novelist and this work about the life of Collins got published in 1884. Charles Allston Collins was Williams another son. He was an artist and writer. Collin’s was born in GreatTitchfield Street in London. He was the son of an Irish born picture dealer and writer, William Collins Sr. At a young age, he developed a great interest for art. He was an informal pupil of George Morland, for some time. He entered Royal Academy in the year 1807. He exhibited for the first time in the Academy in the same year. After his father’s death, he had financial responsibility for his family in the same year. During that time Sir Thomas Freeman Heathcoat, Sir John Leicester, Sir Robert Peel, Sir George Beaumont, and Lord Liverpool became his valuable patrons. He married Harriet Geddes in 1822. She was the sister of portrait painter Margaret Sarah Carpenter. He was awarded a medal in the life school, in 1809. He exhibited three pictures. They were “Boy at Breakfast”, “Boy with bird’s nest” and a portrait of “Master Lee” as he spoke the Prologue at the Haymarket Theatre. For 80 guineas, he sold his picture titled “The Young Fifer” to the Marquis of Stafford, in 1811. He sold “The Pet Lamb” for 140 guineas and was engraved by S.W. Reynolds. Prince Regent acquired “Scene of the Coast of Norflok”. This was done after Collins took a sketching tour of coast near Cromer in 1815. He painted “The Departure of the Diligence” from Rouen and “Scene on the Boulevards”. He painted these two in 1817 on his trip to Paris with Leslie and Washington Allston. These two paintings were sold in private. Around this time he painted several portraits. “The Young Anglers” were presented as his diploma picture in 1820 after being elected as a Royal Academician. Collin’s work received great recognition and popularity as he continued to travel and exhibit in England and Scotland. He painted “The Fisherman’s Departure” in 1826, which was engraved by Phelps. He made a tour of Netherlands and Belgium in 1828. In 1836, for a short time, he was living in Boulogne. 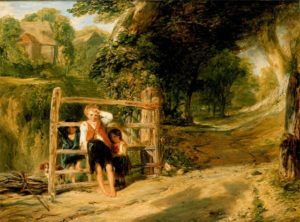 In 1834 he painted “Rustic Hospitality” He painted “Sunday Morning” and “As Happy As a King” in 1836. Collin’s suggests in the latter painting a story of a country boy who loved swinging upon the gate for the whole day, which gave him happiness and enjoyed eating bacon. On 7 nov1814, he was appointed as an associate member of the Royal Academy. In 1820, he became a full member. King George IV, the Prime Minister Sir Robert Peel, four Dukes, few aristocrats, M.Ps, industrialists and members of the clergy were his patrons. Collins left for Italy from London in 1836 and lived there till 1838. These two years he engrossed himself in advancing his knowledge of painting. However, he had to return due to illness. Though he was very popular at his time, he is relatively unknown now and his works that are in public collections are not on display. Some of his works are either lost or in unrecognized private possession.